This was the motto of not one but two ancient Greek traditions: the Cynics and Stoics. Were these traditions naturalistic? After exploring their philosophies and concepts of nature, we’ll have a look at their religious practices to see if they can rightly be counted as ancient Spiritual Naturalists. This post is part of Roots of Spiritual Naturalism, a series exploring the gradual emergence of Spiritual Naturalism in ancient times in order to gain an expanded sense of its meaning and historicity. See Part 1 for an overview. The Cynics were a movement of iconoclasts who founded their philosophy on one crucial insight: culture is arbitrary, nature is real. They were picking up on a philosophical distinction between nomos, meaning law or custom, and physis, i.e. nature. The distinction more or less approximates our modern notions of artificial vs. natural. By making this distinction central, the Cynics were led to reject cultural convention completely in order to live as naturally as possible. The first Cynic is traditionally considered Antisthenes, a pupil of Socrates who emphasized the latter’s teachings on self-sufficiency and virtue (Bragg, 2005). Others transformed this initial emphasis into a way of life characterized by flouting convention. Diogenes of Sinope, for example, lived in an earthen jar, masturbated in public, and gave up all possessions save for a cup. Legend has it that when he saw a child drinking water by cupping the hands, he realized he did not need even this, and smashed his cup. Such eccentric behavior earned them the nickname kynikos, which literally means “dog-like.” This was not mere shock tactics, though; it was mental training. The idea was to rattle oneself out of the slumber of convention, in order to lead a more authentic life. This was a way of life lived according to nature, and no part of it involved deities or magic. Is it therefore naturalistic? On the one hand, it was certainly open to naturalism. That is to say, a Cynic could have been naturalistic without any contradiction. On the other hand, the philosophy was atheoretical, and pronounced nothing on the nature of the gods or the universe. As a result, a Cynic could also have been a faithful theist without any contradiction. Thus, it must be concluded that Cynicism is not inherently naturalistic. Nevertheless, it represents yet another tradition demonstrating that ancient Greeks felt less and less need to involve the gods in their thought; it was part of that “something in the air” which conduced to the spread of naturalism through ancient Greece. The Cynics flourished throughout the ancient world, dying out as late as the 6th cen. CE (Piering, 2006). They exerted a powerful influence on another tradition that would come to dominate intellectuals of Greece and later Rome: Stoicism. It is said that Stoicism’s founder Zeno of Citium, while shipwrecked off the coast of Greece, wandered into a bookshop. Picking up a book on philosophy, he was so taken with it that he asked the bookseller where he could meet such a person. The shopkeeper pointed him to a Cynic named Crates. This story dramatized how Stoicism came to idolize the Cynics. Unlike Cynicism, however, Stoicism takes the idea of living according to nature in a whole other direction. Rather than reject convention in favor of an eccentric life on the fringe, they articulated a way to be fully engaged in cultural and political life while maintaining a kind of serenity in motion. The Stoics agreed with Socrates and the Cynics that virtue alone was sufficient for the good life. Moreover, they defined virtue as living in perfect accordance with nature. What they meant by this “nature”, though, was far more elaborate and unique than previously ventured. For the Stoics, nature was alive. It was permeated by a “designing fire” they called logos, which was identical with reason (Drozdek, 2007). It was also identical with God or the gods, as well as Fate and Providence. It was this logos that gave the cosmos its order, and it was what gave humans the power of reason. A divine spark thus inhered in humans, and to the extent that people adhered to reason they were godlike. Of Heaven, lead me, Father, where you will. I stand here prompt and eager to obey. In other words, the virtuous person acquires serenity in motion by learning to embrace the way things are, rejecting desires for what cannot be or what is beyond one’s power to determine. So, is this tradition naturalistic? From one perspective, it appears thoroughly theistic, yet naturalistic from another angle. A careful study is required to reveal the degree to which it shares characteristics in common with modern naturalism. Recall that in this series we are defining naturalism as “the system of those who find all primary causes in nature” (Furst and Skrine, 1971), where nature is understood as characterized by impersonal physical laws. Hence, the question is: does Stoicism share this view? First, it is clear that all primary causes are ascribed to nature. Logos was the very order of nature, the design and cause behind everything, and the heart of ethics was to live according to nature. In this respect, Stoicism is consistent with naturalism. Second, the Stoics conceived of the logos in material terms. It was a superfine substance permeating the universe, and so the Stoic concept of nature was physical. This too is consistent with naturalism. Third, nature is clearly law-like for the Stoics. It is a rational order that makes no exceptions for the pious; good and bad alike must conform to the same unbending nature. We do not find Stoics praying for divine intervention on their behalf. Rather, Marcus Aurelius, in his Meditations, advises a man not to pray to possess a woman, but to be free of lust for the woman. In other words, the focus is turned back on one’s own human practice of virtue. Thus, the Stoic concept of nature is law-like. All that remains, then, is the question of impersonality in nature. This is the one point where Stoicism differs from naturalism, though only slightly. On the one hand, the Stoics conceived of nature as alive, rational, and providential, and called it by divine names such as Zeus. To this degree, nature was not impersonal for them. In some respects it is similar to the kind of God that would emerge in later Christian theology. On the other hand, unlike the Christian God, the Stoic logos conveys no sense of love, grace, or favor for individuals. In fact, individuals may suffer terribly, despite their virtue, if such is what must be in order to achieve the overall best possible universe. As mentioned above, it makes no exceptions for the pious. In this respect, nature appears impersonal. However, this is more like the impersonality of a judge than that of naturalism’s non-sentient universe. On the whole, it must be conceded that the Stoic concept of naturalism was personal. At the end of the day, then, Stoicism cannot fairly be called naturalistic in the fullest sense of the word, yet it comes quite close. Moreover, its ethics and therapeutic techniques involve little of the non-naturalistic elements, such that later Roman Stoicism was able to de-emphasize the theistic aspects and concentrate on a mostly naturalistic Stoic ethics. It is not inconceivable that some ancient Stoics even conceived of a logos that was unconscious, coming even closer to impersonal naturalism. Most aspects of the philosophy, apart from providence perhaps, do not seem to require a conscious designer. This enables us to conclude that Stoicism, like Cynicism, represents a tradition which is at least highly conducive to naturalism, if not naturalistic in itself. Spiritual Naturalism in the Cynics and Stoics? If these traditions were at least conducive to naturalism, to what extent did they combine this with spiritual practices? Were they Spiritual Naturalists? As seen previously, in this series we’re defining spirituality as attendance to the spirit or essence of life as manifested through specific emotional responses, cognitive contexts, and practices. The most easily detectable evidence of such spirituality is practices, which may be either religious or secular in nature but always aimed at the spirit of living a full and flourishing human life. There are a few records of Cynics commenting on religious matters, but this was usually only in order to further ridicule convention. For example, Diogenes is reported to have said to a woman kneeling before the gods in an ungraceful position that the deity might be behind her, so she should watch out (Drozdek, 2007). The mocking tone here is unmistakable, and should not be taken for genuine interest in religious matters. On the whole, Cynicism appears indifferent to religion. Some may have carried on religious practices, but many may well have rejected them as mere customs. They did, however, engage in numerous practices of a more secular nature, such as the eccentric mental trainings mentioned above. Diogenes was also known to embrace cold statues in order to discipline himself out of the luxury of comfortable temperatures. Such activities were explicitly aimed at the goal of achieving a true realization of human nature as expressed in the Cynical ideal. The Cynics, then, clearly display spirituality, and any who may have held a naturalistic worldview would have been examples of Spiritual Naturalists. As for the Stoics, they were often deeply involved in religious practice. Parker (2007) observes “they supported and practiced traditional cult wholeheartedly.” They observed traditional sacrifices and defended divination. As mentioned above, they advocated prayer, though perhaps not the kind that begs for divine intervention. In fact, what we now know as the Christian “serenity prayer” derives ultimately from Stoic antecedents. A second-century BCE inscription from Athens lists a series of Stoics who served as hieropoioi or “performers of sacred rites” (Parker, 2011). Thus, the Stoics were actively religious. The way they interpreted the gods was different from the norm, however. While they were comfortable calling the logos by various divine names to emphasize its different aspects, they were not polytheists in the traditional sense. For them, the gods of myth were symbols masking aspects of what was truly divine: nature. They allegorized Hera as air, for example, and Hephaestus as fire. In this use of allegory, they were not unique. They were following the Plato’s example, who in turn followed a long-standing tradition. Greeks had always known their gods were symbols, but they were also real beings. The Platonists and Stoics, however, attenuated the latter half of the equation, using allegory to bring the essence of the gods into line with their own philosophies. In sum, the Stoics, with their near-naturalistic philosophy, did not reject religious practices, but reinterpreted them. In addition, they engaged in a panoply of less explicitly religious practices, including redescribing objects of attachment in order to become indifferent to them (e.g. a favorite piece of china becomes a mere jug) (McEvilley, 2002), withholding assent to impulses out of accord with nature, practicing reservation about outcomes, and other activities (Seddon, 2006). Stoics were clearly spiritual. If there were some whose version of Stoicism could rightly be called naturalistic, then they would also be rightly called Spiritual Naturalists. Indeed, Stoicism fits in well with modern Spiritual Naturalism. There is still a small but enthusiastic Stoic community today, and many consider themselves atheists. Attempts have even been made to put forward an entirely naturalistic version of Stoicism (e.g. Becker, 1998). This philosophy thus represents yet another important tradition in the ancestry of modern Spiritual Naturalism. This article was first published at Patheos.com, minus substantial revisions. Becker, L. (1998). A New Stoicism. Princeton, NJ: Princeton University Press. Drozdek, A. (2007). Greek Philosophers as Theologians. Hampshire, UK: Ashgate Publishing, Ltd.
Epictetus. (2004). Enchiridion. Long, G., trans. New York: Dover Publications, Inc.
Gill, C. (2010). Naturalistic Psychology in Galen and Stoicism. New York: Oxford University Press. Long, A. A. and Sedley, D. N. (1987). The Hellenistic Philosophers, Vol. 1. New York: Cambridge University Press. Marcus Aurelius. (1964). Meditations. Staniforth, M., trans. New York: Penguin Books. McEvilley, T. (2002). The Shape of Ancient Thought: Comparative Studies in Greek and Indian Philosophies. New York: Allworth Press. Parker, R. (2011). On Greek Religion. Ithaca, NY: Cornell University Press. Seddon, K. (2006). Stoic Serenity: A Practical Course on Finding Inner Peace. Lulu. Seneca. (2004/1969). Letters From a Stoic. Campbell, R., trans. New York: Penguin. Were Early Agricultural Peoples Naturalistic? Were Archaic Egypt and Mesopotamia Naturalistic? Were the Ionian Philosophers Naturalistic? Were the Atomists and Epicureans Naturalistic? Question: should we really consider ‘personal’ to be a core requirement of naturalist, particularly when talking about ancient peoples? While naturalists today would not presume agency on a universal level, is this perhaps happenstance due to the evidence? For example, we naturalists today already acknowledge that a ‘person’ exists in human beings, which is some kind of emergent collection of properties which seem to arise from natural processes. So, if ancient people approached claims using reason (rather than faith), and they consider the universe to be one physical whole acting according to laws. Then, if they thought that a person existed throughout the cosmos in the same way in which personhood arises in us, would that not simply be a physical theory of the time? Suppose Newton’s laws had previously been closely associated with some religious order. Long after Einstein refined them, would we consider Newton’s views non-naturalist? To me, their thoughts about personal agency in the cosmos may not be that different from consciousness philosopher David Chalmers’ thoughts on the nature of consciousness in complex systems not necessarily needing to be biological (is the eco-system conscious at some low level? for example). Plus, as you mentioned, Stoics varied in their interpretations of how personal the logos was. D. T. Strain, you query/comments are somewhat above my ability to respond, but I can’t resist such a noble challenge. The Stoicism of Marcus Antonius Aurelius via the Meditations (George Long translation specifically) is what I am most familiar with and can most easily relate to. As far as the “personal law” vs. “science of the moment” aspect, first of all I don’t see science as simply a growing collection of often conflicting data analyses but rather a growing understanding (from innumerable lifetimes of hard work) of how Nature (/the Universe/God) works, as do many excellent scientists (while understanding many on the other hand are atheists due to the non-logic aspects of religion). And so I don’t really feel the separation so much between whatever spirituality one carries and science. And so I don’t see science being mere “science of the moment”… Newton’s laws simply became a subset of a greater understanding as an example. One likely result of my personal interest in Stoicism is spending much of my spare time learning about climate science and doing what I can to address AGW (largely via the Citizens’ Climate Lobby – follow the Stoic mandate of getting out of the ivory tower enough to do your duty of using your noggin to do good in the public sphere, with zero reliance on “the clapping of tongues” as Aurelius put it). 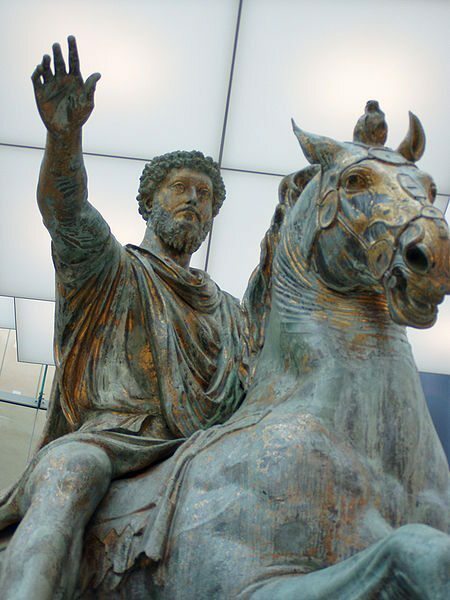 Aurelius (perhaps partly from his being an seasoned Emperor) does frame much of Stoicism in terms of doing your duty under unbreakable law, but that law says you must do what is good to the best of your honest understanding or you’re “an abscess or tumor upon the Universe”, so it’s a rather benign, positively constructive law there! That strong attempt at honest understanding includes an understanding that one’s all-important opinions can change upon credible new information conflicting with one’s prior opinions, and so sometimes one must update one’s opinions accordingly… Which could relate to the “science of the moment” idea. Given the fact that we can measure measure consciousness as a form of energy and the fact that science is actually trying to build a device to communicate with the universe I advise changing that position “naturalism’s possibly sentient universe”.